Midfielder Cameron McGeehan insists the pressure on Town’s players for Saturday’s crunch clash with high-flying Southend is right up his street. 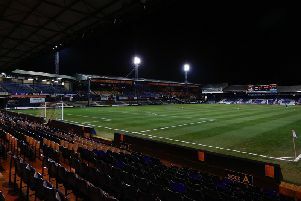 The Hatters go into the game level on points with seventh-placed Plymouth Argyle, who entertain Tranmere, and four behind Stevenage, who are at home to Carlisle. After being a spectator for the 2-0 win over the Shrimpers in October, McGeehan saw no reason why Hatters can’t produce a repeat showing, in front of a 2,000 plus away following. He said: “It’s what we love, what we’re here for, the fans will love it too. “Southend are a good team with a good manager. I came to watch the game against Southend and we absolutely dominated the game, battered them. McGeehan is also determined for Hatters to put their destiny back in their own hands as well with just two games remaining.